A - I'm originally from New Jersey, went to graduate school in Tucson, AZ, and just got back to the U.S. after working in New Zealand as a professor/researcher in psychology. I researched things like the escalation of violence, prejudice, stress, and how various patterns in the heart's EKG signal match up with emotion. Q - Prior to Data Science - What in your career are you most proud of so far? A - I went to grad school to study social psychology. That involved doing lots of experiments (mostly on intro psychology students) and then analyzing the data from those experiments. Right from the start it was fun exploring the data. Exploring each data set felt like unwrapping a present. It generally wasn't the present I wanted, but I still liked it. A - Data from a small psychology experiment. I probably ran a few descriptive stats and then ran an ANOVA with a couple follow-up t-tests. A - Can't remember a specific moment. But I was definitely drawn to the idea that splitting up a data set in different and creative ways might reveal insights that weren't obvious to the typical person. A - I wish I'd learned to program ten years ago. Just an intro to python course would have been enough. Q - How did you come into your current position at the Metis Data Science Bootcamp? A - I was working overseas in academia and wanted to move back to the U.S. and to find work where I'd get to keep working with data. I started reading about data science and got interested in how they were visualizing it and using it to predict. I realized that there was a big gap in the tools I'd been using to analyze data and the programming tools that data scientists were using. So a data science bootcamp made a lot of sense for helping me bridge that gap. Q - What interested you about Data Science? A - I want to be able to use programming languages in order to be more flexible with data. For years I've had ideas for projects that I've given up on or dismissed because getting the data and manipulating the data was going to take way way (way) too much time -- like manually cutting and pasting thousands and thousands of times. Q - What about Data Science work seems most interesting to you? A - I spoke to an academic friend of mine the other day about Metis, the data science bootcamp I'm taking part in. When I described to him the machine learning and cross validation approach, he tried to sum up what I was saying with: "So academics are good at explaining why things work but they can't predict s$%#. And data scientists are good at predicting things but they can't explain how anything works." I know that's not true and that's a gross oversimplification, and that good data scientists are trying to both predict and build theories about why things work. My point is just that figuring out how to best predict patterns in a new data set has been new and very interesting for me. It seems to me that when the test of a person's analysis is how well they can predict the future, they're putting their money where there mouth is. I also like that data science is frequently about building things, rather than solely about statistical analysis. Lots of room for creativity in that. Q - That's great! So what type of data science are you most interested in? A - I've spent my career examining social issues and physiology/health. So I'd love to find work that's related to one or both of these things. Helping government agencies examine their data to think about policy and social problems would fit that bill. Working in the healthcare industry would fit that bill too. And I'm fascinated with wearable tech devices that track health-related information. Q - Why choose a bootcamp to enter the data science market and how did you search for one? A - To smooth and speed the transition from the academic world I needed help figuring out what tools to focus on, help actually learning the tools, and help building a network and making connections to people in the data science world. Metis, true to their word, is doing all of that. Q - Why did you choose Metis and what has been the best part about it? A - The instructors were a big part of my decision. The fact that there are two incredible instructors in the same room with me every day that I can continually pepper with questions. That's huge. I also like the social aspect of being in a class. Q - Makes sense! Knowing what you know now, what advice would you give to someone considering a data science bootcamp? A - The bootcamp instructors will clearly be at the core of your experience. So it makes sense to research who they are and what they're like. Maybe they have blogs or have been interviewed somewhere? And hopefully you're able to talk to at least one of the instructors during the interview process. Q - What does a typical day at bootcamp look like for you? A - Usually we have between 1 and 3 hours of lecture in the morning. In the afternoons we're working on problems or some sort of a project. And about 2-3 times per week there are outside speakers. These are data scientists from the community who come in to talk to us about their work. Q - What tools do you use at bootcamp and what have been your favorite so far? A - So far, most of the stuff we've done has revolved around Python in one way or another. This past week we started using D3 for data visualizations. As for my favorite tools, Pandas has been super useful and it's involved in most of the work I've done. Scikit-learn has been the most fun for me to learn and play around with. Q - What tool are you most excited about? A - I've been obsessed for the past year with the new-ish technology that allows for extracting the heart signal from a simple video recording of a person's face. That's more computer science than data science, but I think it's got plenty of implications that are related to data science. Andy - Thank you ever so much for your time! Really enjoyed learning more about your background, your move to data science, your choice of going to a data science bootcamp, and why you chose Metis Data Science Bootcamp in particular. Good luck with all your ongoing projects! Readers, thanks for joining us! If you want to find out more about Andy Martens, he can be found online at LinkedIn here. 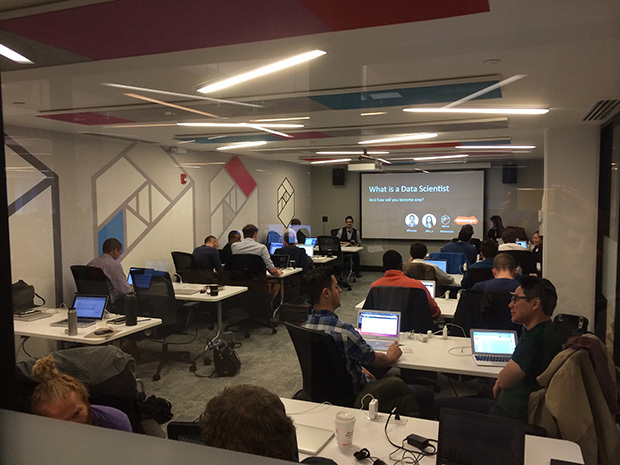 If you want to find out more about Metis Data Science Bootcamp, Metis can be found online here and on twitter @thisismetis. If you are interested in attending the bootcamp, check them out here for their final March 9 application deadline and apply now here - Metis Data Science Bootcamp. The next dates of the bootcamp are the Spring bootcamp: April 6, 2015 - June 26, 2015.